Last night one of my best friends had her first baby! He's super adorable and I can't wait until I can hold him!! A group of quilty friends and I got together to make him this quilt. It was delivered to her mere hours before she went into labor - just in time! Perhaps he was waiting for the quilt? 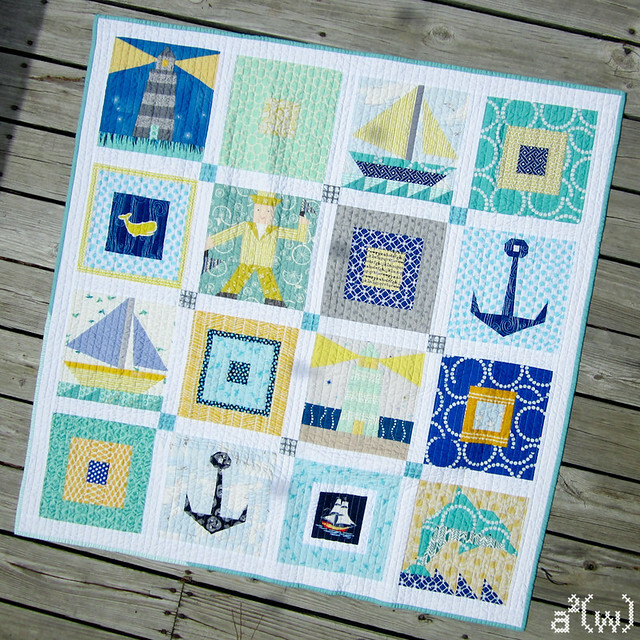 His nursery is nautical themed in aqua, yellow, and gray. We were selective and decided to only add bright blue to the scheme for the quilt. Most of these blocks are paper pieced from a Japanese book. I made the nighttime lighthouse (top left) and the sailboat two blocks below it. And assembled all the blocks. And spent way too long straight line quilting it! If you look closely you'll see a lot of HTF coveted fabrics in there. You have to use the good stuff when making quilts that will be cherished forever! I used all of my Simpatico on the back. I thought it would make a cute background for his monthly growth pictures is she decides to go that route. On the bottom you can see the signature block that I wrote our names on. On the top I included pockets so that it could be hung on the wall. This is so adorable! I'd love to know the name of that Japanese book. I feel like I'm always making nautical quilts and I could use more ideas! Such a wonderful gift - I bet your friend (and her bub) will love it! 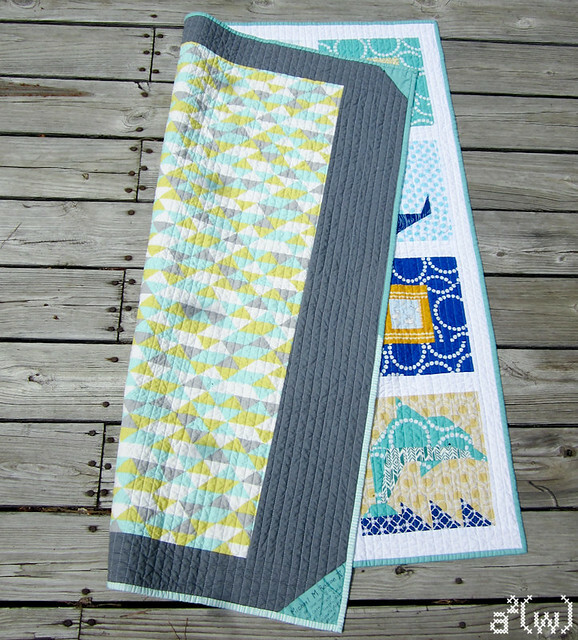 I really love your close line quilting too, it makes such beautiful texture. Did you use 'wee wander' fabric as the background to your lighthouse? What a sweet quilt! 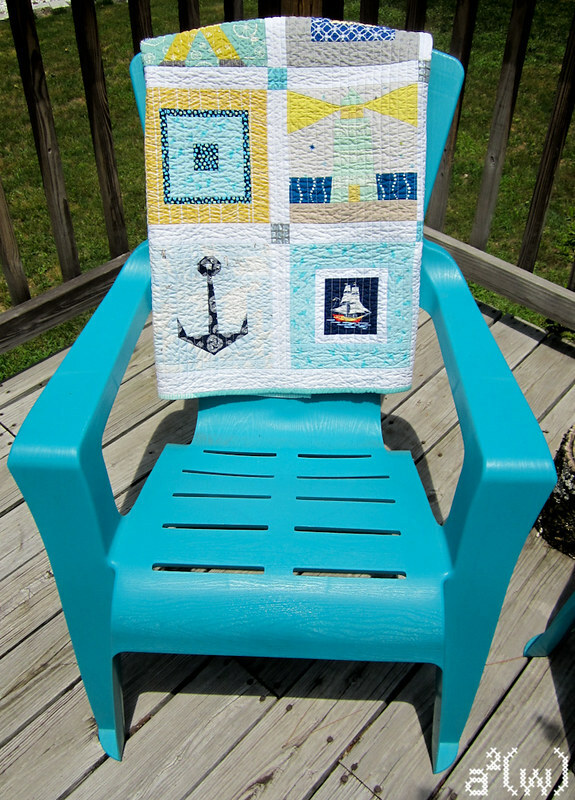 I love the nautical theme, the colors and quilting. Awwh, what a special gift. I love the color and the theme. what a fabulous quilt, so lovely!